ProX piston rings are made by OEM factories to exact specifications. ProX uses well known brands like Rikken Japan, TP and NPR to be sure you will get the quality you might expect from our brand. All ProX piston rings can be used in cast iron bores, nickel ceramic platings (Nikasil), boron composite and electrofusion bores. 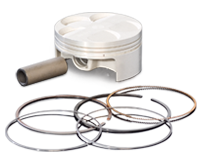 If the application has a OEM cylinder with chrome bores, ProX supplies a different piston ring as in the ProX piston kit. ProX Racing Parts offer a wide range of piston pins in many sizes and specifications. We offer straight wall and tapered wall pistons pins. 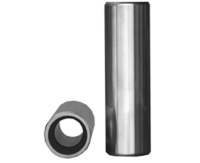 Our chromed pistons pins are specially designed for the application. Every ProX piston pin is machined precisely and treated to get the best hardness and properties to stand the extreme conditions where it is used for. ProX Racing Parts offer a wide range of clips for many piston diameters in different styles depending on the application: C-style & G-style. Piston clips are not just a circled wire. They avoid the pin to move in the piston bosses. Do not underestimate the forces on the pin during operation.